Photo courtesy of Norwegian Cruise Line. Norwegian Cruise Line is increasing the recommended amount of gratuities for onboard staff to $12.95 per guest, per day, for stateroom categories up to mini-suites and $14.95 per person, per day, for suites. Currently, the line recommends paying services charges of $12 per person, per day. The new charges will go into effect for sailings that begin on March 1, the line told travel agents in an email. Guests who previously booked a cruise and are sailing after March 1, or who are planning to book a cruise now through Feb. 28, can pre-pay service charges at the current rate by Feb. 28. Guests with existing cruise reservations who have already pre-paid their service charges at the current rate will not be affected. Norwegian’s daily service charges were last adjusted in 2009. 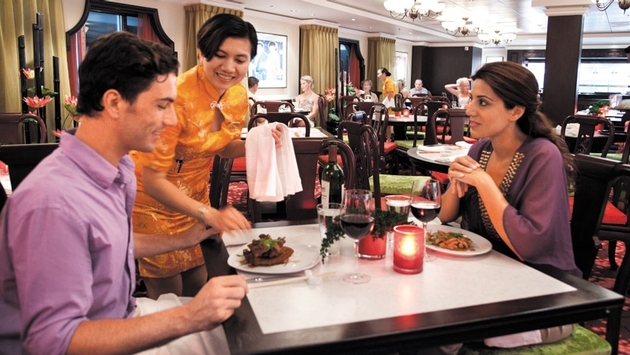 Passengers can choose to pay the recommended daily fee on their shipboard account to tip their room steward, restaurant servers and behind-the-scenes support staff. Those in suites are asked to pay a higher daily service fee because they also receive the services of a concierge, butler and dedicated wait staff. The cruise line sets a recommended amount but guests can adjust the service fees up or down to reflect their satisfaction with the service. Some passengers also still choose to tip staff favorites with cash.